A full-size image (281 kb) is also available. Brooklyn Bridge: Entering Manhattan from Brooklyn, the Brooklyn Bridge ends in a complex series of interchanges with FDR Drive and several downtown Manhattan streets. The first ramp connects to Park Row northbound where it enters the Police Plaza underpass. Police Plaza connects the NYPD headquarters (right) with the Municipal Building (left). The second ramp is a tight loop that crosses over the ramp to Park Row. 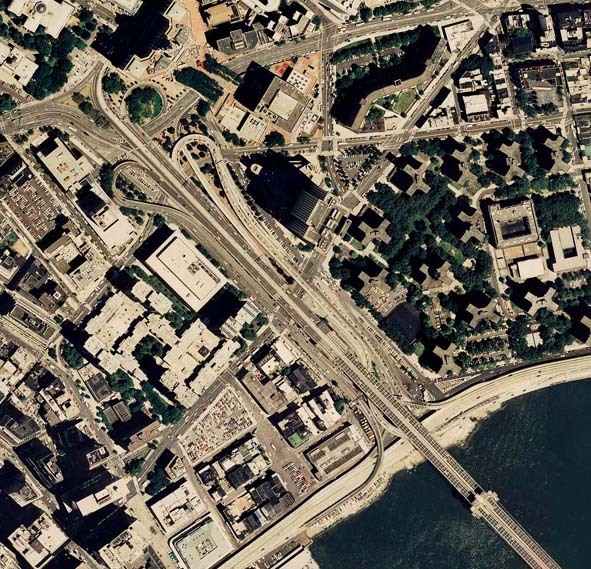 A left-hand branch next to the New York Telephone Building leads to Pearl Street and continues on to FDR Drive southbound and the surface artery beneath it, South Street. The right-hand branch crosses over Pearl Street; from which an entrance ramp rises up on the right (from Franklin Square, beneath the bridge). The combined roadway swings under the bridge right and left before merging with northbound FDR Drive. 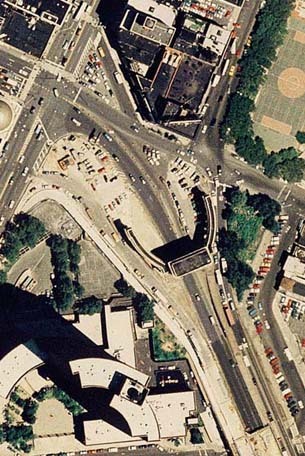 The third ramp is a cloverleaf to Park Row southbound, which is shortly joined by Centre Street at New York City Hall, top left corner. Finally, the bridge roadway swings right as the northbound lanes of Centre Street, which continues uptown past the many courthouses and other government buildings of Lower Manhattan. The ramp from the Brooklyn Bridge to FDR Drive and Pearl Street is almost exactly mirrored on the opposite side of the approach. A ramp from northbound FDR Drive swings left over the highway and runs alongside the Brooklyn Bridge. An interesting feature of these ramps is that they run in the "wrong" direction; that is, against the flow of traffic on the adjacent bridge roadway (cf. NY 363 in Binghamton). However, the bridge is at a significantly higher elevation than the ramps, and consequently motorist confusion is not an issue here. The exit for Pearl Street splits to the left, just before the ramp from southbound FDR Drive (which also provides access to Pearl Street at R. F. Wagner Sr. Place, opposite Avenue of the Finest) joins at the right, almost directly beneath the bridge structure. The entrance ramp from Pearl Street joins next, and another tight loop swings traffic around onto the Brooklyn Bridge. Here a ramp from Park Row northbound joins at the left (the connection from Park Row southbound is missing), and the final merge connects with the main approach, from Centre Street. Manhattan Bridge (right): The Manhattan Bridge's lower deck connects to the intersection of Canal Street and the Bowery, serving traffic primarily to and from the north and west. The upper deck provides more local access to Chrystie Street (one block parallel to the Bowery) and eastbound Canal Street, and from the Bowery northbound. An ornamental archway forms a portal to the bridge at the Manhattan end. The inner roadways (lower deck) pass through this, while the outer roadways run outside of it. This website ©1999-2004 by N. W. Perry.